Before I talk about ways of external hard drive partition recovery, I like to make a brief introduction of partition table, as it plays an important role in partition recovery. As we all know, each hard drive or external hard drive have one or several partitions, and partition table records all information about those partitions. Partition table records information about partition number, size, partition type, partition’s beginning and ending sectors, file system, name, etc. Partition table can get damaged by a variety of reasons, such as corruption, virus, improper actions, wrong manipulation, bad sectors, etc. Partitions may get lost if partition table is damaged. Besides, partition formatting or deletion can cause data loss and needs partition recovery. It is easy to achieve external hard drive partition recovery and recover files of partition as long as you use safe and powerful partition recovery software. If you search this problem on the Internet via entering key words like “external hard drive partition recovery” or “external hard drive data recovery”, then you can find quite a lot of programs can help you. 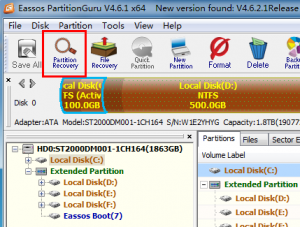 Here is a simple solution of partition recovery with PartitionGuru. PartitionGuru is powerful and versatile partition recovery software which can have you recover lost partition and recover files from inaccessible partitions easily and safely. 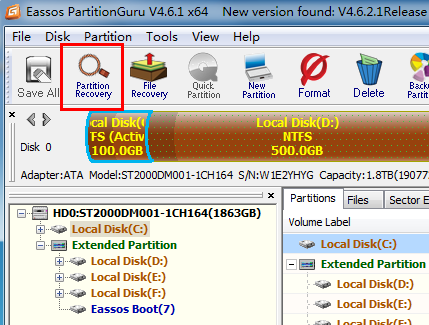 You can click the button “Partition Recovery” to search for lost or deleted partitions of external hard drive. When lost partitions and files are found safely, you can save and rebuild partition table, so that you can access these lost partition in My Computer again. What’s more, PartitionGuru also allows users to perform files recovery, partition management, system backup and restore, etc. This program offers all-sided functions, which is praised and recommended by millions of computer experts and IT technicians. This entry was posted in Data Recovery and tagged External hard drive data recovery, external hard drive partition recovery, partition recovery, partition recovery software, recover lost partition by EASSOS. Bookmark the permalink.